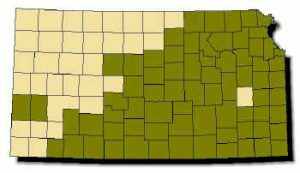 Range: Ranges from eastern third of Kansas southwest to Red Hills and into adjacent southern High Plains as far west as Kearney County; avoids northern High Plains. Description: Harmless. Smooth scales; light and dark pattern on belly; 40–78 dark gray or brown blotches on back. 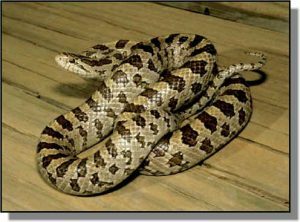 Head, body and tail are brown or gray; dark gray or brown blotches on back are edged with black; 2–3 series of small brown or gray spots on sides alternate with blotches on back. Belly is white with dark irregular markings. Young look like adults. Habits: Inhabits rocky hillsides with open woods, prairie grassland and sand prairies. Very secretive; when not actively prowling, retreats beneath rocks or down burrows of other animals. Active from April to October; nocturnal during summer months. Five to 17 eggs per clutch; eggs hatch in 1-3 months. Constrictor. Feeds on small mammals, small snakes and lizards.